Raigad Fort is one of the most important forts in the history of Marathas, being the first capital of independent Marathi kingdom or “Hindavi Swarajya”. Graded as the most secured and most appropriate location by the King himself, the fort stands proudly showing the strength of the Maratha Empire. 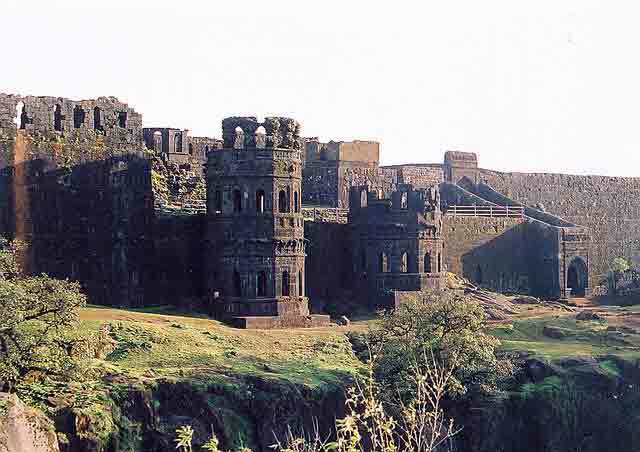 Raigad fort is situated 25 km north of the modern day Mahad town. Being situated comparatively near to the sea, with Mahad being in reach, and at same distance from Mumbai, Pune and Satara, Raigad enjoyed a strategic position. Moreover, it is an important link between the Deccan plateau and the coastal Maharashtra. 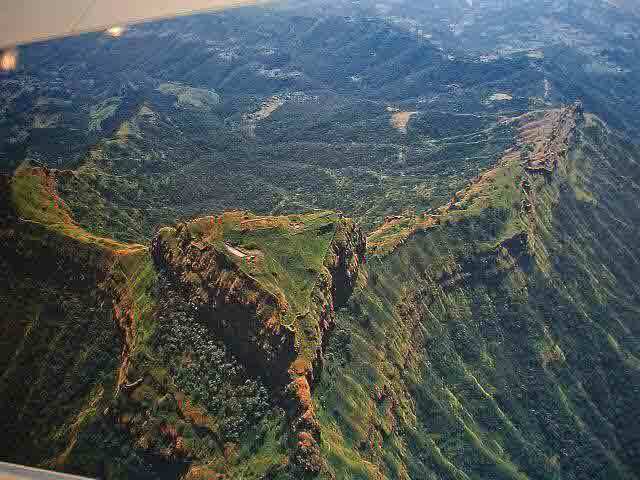 Raigad was known as the mountain of “Rairi” before it was captured by Shivaji Maharaj. Due to its impregnability, Raigad was known as “Gibraltar of East”. In the 16th century, when this was not developed as a fort, it was called by local people as “Rashivata” and “Tanas”. Due to its shape of a tall oil lamp tower, it was also called as “Nandadeep”. The fort was called by 15 different names by different people at different times – Raigad, Rairi, Islamgad, Nandadeep, Jambudweep, Tanas, Rashivata, Badenur, Raigiri, Rajgiri, Bhivgad, Reddi, Shivlanka, Rahir and Gibraltar of the east. The fort was initially used to keep prisoners during the Nizamshahi rule. It was then ruled by the More clan of the Javli region. On 6th April 1656, Shivaji Maharaj besieged Rairi and captured it in May. The then Subhedar of Kalyan was transporting the treasure of Adilshah to Bijapur, which was raided by Marathas and utilized to fortify Raigad. It is mentioned in “Sabhasad Bakhar” how Shivaji Maharaj selected the fort as the first capital. राजा खासा जाऊन पाहता गड बहुत चखोटा. चौतर्फा गडाचे कडे तासिल्याप्रमाणे दिड गाव उंच. पर्जन्यकाळी कडियावर गवत उगवत नाही आणि धोंडा तासीव एकच आहे. दौलताबाद पृथ्वीवर चखोट गड खरा, परंतु तो उंचीने थोडका. दौलताबादचे दशगुणी उंच असे देखोन बहुत संतुष्ट झाले आणि बोलिले, तक्तास जागा हाच गड करावा’. ‘The King observed that mountain of “Rairi” was the best place, steep on all sides and tallest of all, the whole mountain being a seamless rock. Daulatabad is also good, but less tall than this one. This fort is taller and better then Daulatabad and hence the best place for the throne.’ Raigad has been one of the most importance forts, and has been a witness of significant events – Shiv Raajabhishek (The Coronation ceremony of Shivaji Maharaj) was the most significant event in the history of India. 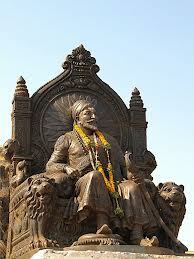 Shivaji Maharaj became the King of the newly formed Maratha kingdom after a struggle of more than 300 years. Shivaji Maharaj took the blessings of Bhavani Mata of Pratapgad on 19th May 1674 and offered a golden umbrella (Chatra) worth Rs. 56,000 to the goddess before the ceremony. The ceremony took place on the auspicious day of 6th June 1674, which was a Saturday. On 4th February 1675, Sambhaji Maharaj’s thread ceremony took place on Raigad, and on 7th March 1680, it was Rajaram Maharaj’s ceremony. 8 days later Rajaram got married to Prataprao Gujar’s daughter. Tourists can either reach the top of the fort by trekking or take a ropeway. There is a ropeway at the base village which takes you to the top in just 4-5 minutes. So senior people or physically challenged persons can take a ropeway. This ropeway project of is a non-profit activity which was completed in 1996 under the leadership of late Shri V M Jog. One can have a great experience in monsoon season when it feels like a moving in Sahyadri Mountain Range amidst clouds, mist, and lush green surroundings. Earlier there was only one route to reach the top and awards were given to the person who used to climb the fort via mountain ridges and unconventional methods. 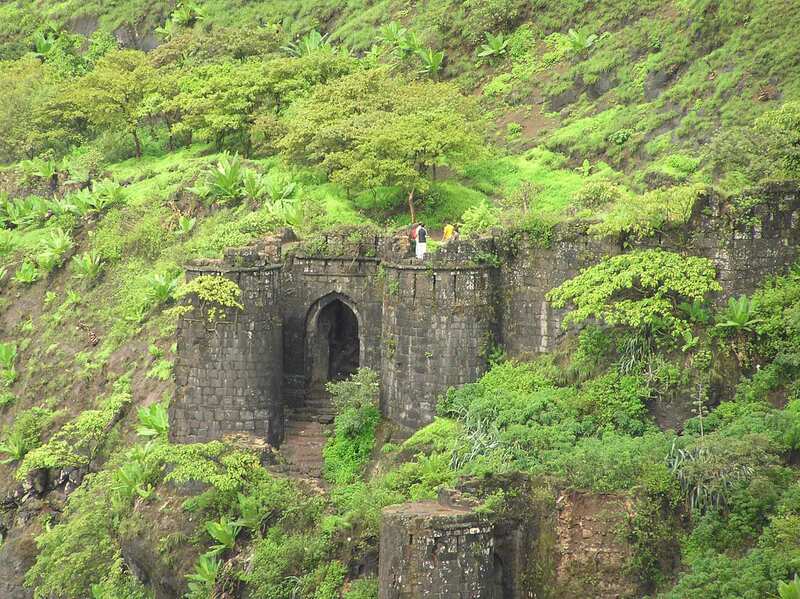 Raigad is one of the most famous trekking destinations in Maharashtra. There are total 1737 steps on this fort. Trek to Raigad takes about 2 hours to reach the top of the fort. One can experience the splendid natural beauty of Raigad in the monsoon season. June to October is the best season to enjoy the eye-pleasing views of surrounding Sahyadri Mountain Range. In monsoon season, local people set food stalls in between the trekking route of Raigad. 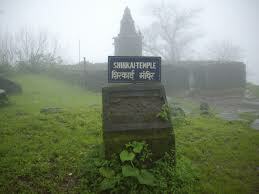 Overall it is an exciting trek that can be completed within one day from Pune. There are many hotels nearby the vicinity of Raigad fort Maharashtra. MTDC resort with good accommodation facilities is also available in Raigad. Eating Staff : Few eateries and hotels are there nearby the fort. Sometimes local people also sell delicious food items like Pithl-Bhakri, Thecha etc. One can easily reach Mahad by ST buses. From there paid vehicles like jeep are available till base village of the fort – Pachad. It is 132 km away from the Pune city. Pune – Kamshet – Khopoli – Sajgoan – Raigad. 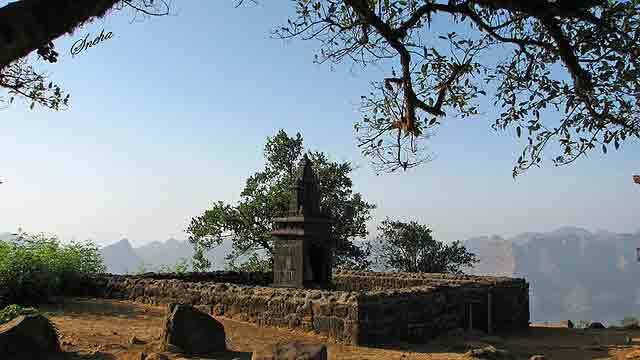 Mumbai – Panvel – Pen – Nagothane Fata – Indapur – Mangaon – Mahad – Pachad (Base village Raigad fort Maharashtra). Travelling by road instead train displays amazing scenic views. It is recommended to take the route via Mahad instead of Mangaon. The route via Mangaon is very bad and not much exciting. Though the route via Mahad is bit long but is goes through highway and gives nice views! Pune airport is the nearest airport to this fort. It is about 126 km away from the fort. Mangoan station or Vir-Dasgaon stations on the Konkan railway are the convenient railheads to reach Raigad fort Maharashtra. Buses and other private vehicles are available from stations till the fort. People from Mumbai can reach this fort by Boat. Motor launches are available from Gateway of India in Mumbai to Alibaug. They take only 45 minutes to reach Alibaug. Then you can catch private vehicles from there till Raigad. The samadhi of Maharaj is the main attraction on a fort. The samadhi of Waghya (Dear dog of Shivaji Maharaj) is also there. There is a deep valley down this point of the fort. It was used to push the criminals into the valley for the death sentence. It serves as a gate of Balekilla. Nagarkhana is situated in front of the Sinhasan of Maharaj. Mahadarwaja is a main gate of the fort. It is a huge door that comes from Pachad village. This door has a strong fortification on its both sides. 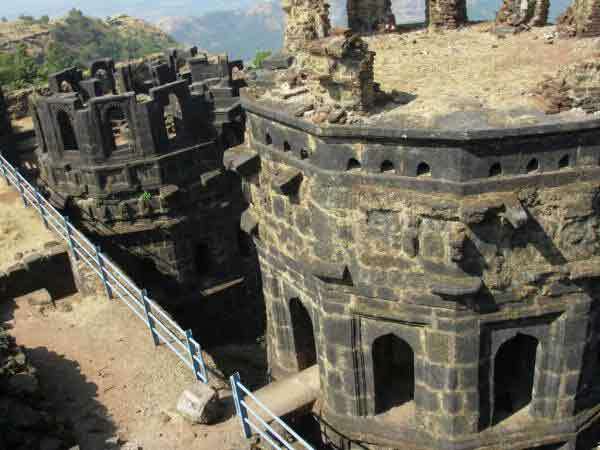 Doordarshan has managed to construct a very high tower on the Raigad fort Maharashtra. This place is situated next to the Nagarkhana which used to have 22 Store. Today this building is in ruins.